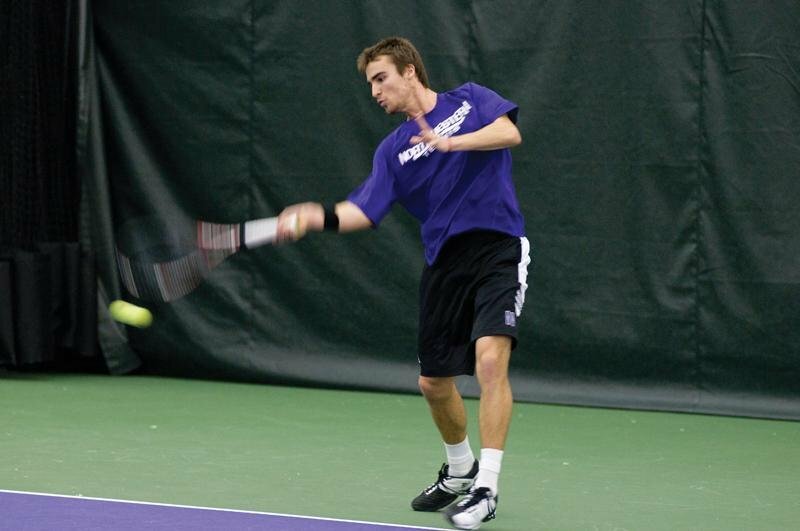 Alex Pasareanu lost in the second round of the ITA All-American Championships in Tulsa, Okla. The junior is one of the new leaders to emerge within a young Wildcat squad that has four freshmen on its nine-man roster. The Wildcats fell short during last weekend’s bid at the ITA All-American Championships in Tulsa, Okla., with freshman Sam Shropshire losing in the final qualifying round Monday. Junior Alex Pasareanu, sophomore Mihir Kumar and freshman Konrad Zieba traveled with Shropshire and coach Arvid Swan to the team’s first tournament of the 2013-14 campaign. Swan, though expressing a hint of disappointment in the outcome, said he believes the tournament proved valuable for his players. “On the whole, we had some mixed results, but I think it was a really good experience for the guys to play some of the best players in the country,” he said. All four of Northwestern’s competitors at the tournament were successful in their first round qualifying matches, with Pasareanu advancing on a bye. The team’s matches Saturday were highlighted by Kumar’s decisive two-set victory over Big Ten foe Elliott Yee of Indiana (6-3, 6-1). “But I thought I handled it really well,” he said. Kumar and Zieba both fell in the third round, and Pasareanu lost a close second-round match to Jacoby Lewis of Texas. Shropshire also played a lengthy set in his fourth-round matchup with Jordan Daigle of Virginia. He said the draining first set affected his performance in the remainder of the match, as he dropped the second set 6-0 to be bounced from the tournament. Shropshire gave credit to his opponent for the victory. Last year’s 23rd-ranked tennis recruit nationally, Shropshire leads a crop of NU freshmen touted as the eighth best in the country by the Tennis Recruiting Network. But Shropshire said he feels little pressure as a result of such high praise. For that to happen, Swan said Shropshire and other young players will need to perform well this year. The nine-man squad, comprised of four freshmen and a single senior, will look to continue the winning ways of last year’s more experienced team that went 22-10.